Desperate times call for desperate measures. 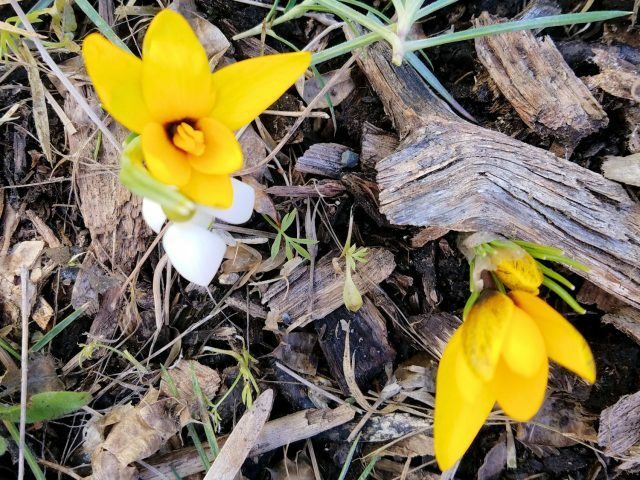 And who is more desperate than the cold climate gardener who’s been inundated with social media images of spring flowers blooming in warmer climates? Thank goodness my “desperate measures” are already in place. 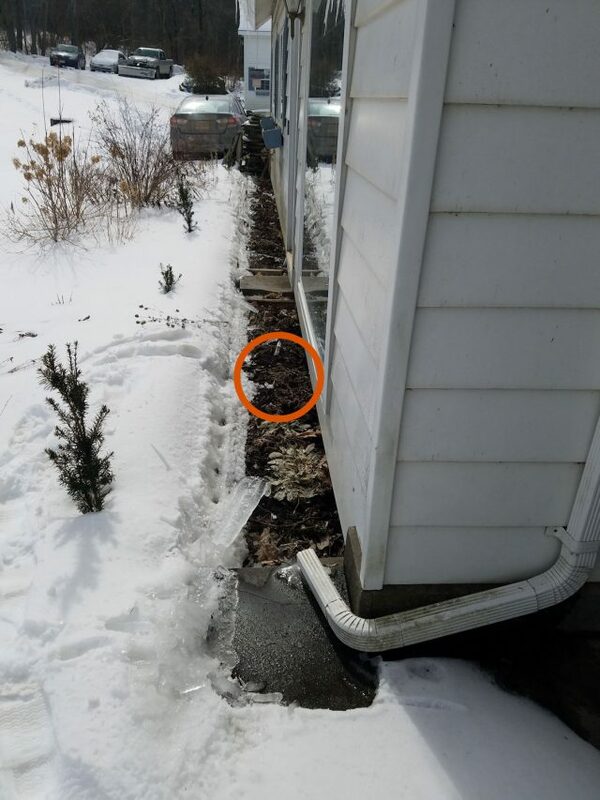 I’ve been planting early blooming bulbs where the snow melts first for several years. 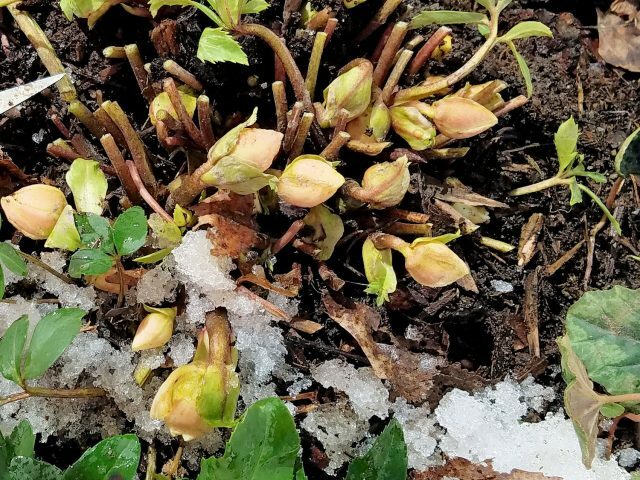 And every time the snow starts to melt, I check all those places for signs of emerging sprouts. 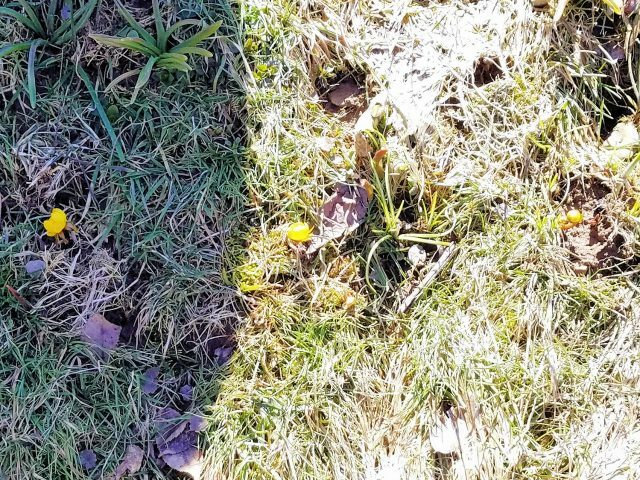 Yes, I check during every thaw, even the January and February ones, and sometimes I do see the green points of leaves-to-come. This week we had a real thaw, with temps rising into the 60s (~16C) on the last two days, and I was rewarded with blooms in many places. But it started with just one bloom several days earlier. 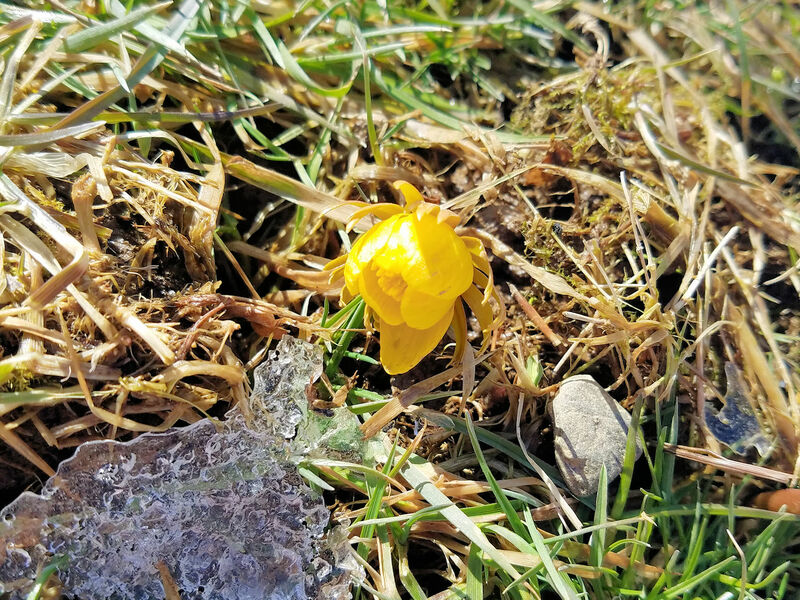 The very first flowering bulb of 2019. People, I planted this over the septic tank! It was the only place the snow had melted at the beginning of the thaw. It was one teeny flower surrounded on all sides by snow. 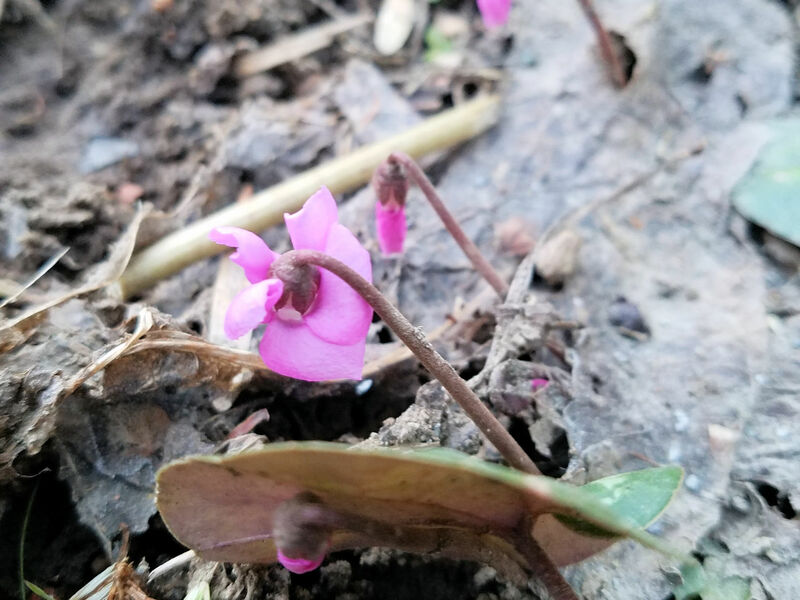 And yes, it gave me hope, too, which is exactly why I planted a mix of Aladdin’s Carpet and Woodland Blend (both from Colorblends) over the septic tank last fall. 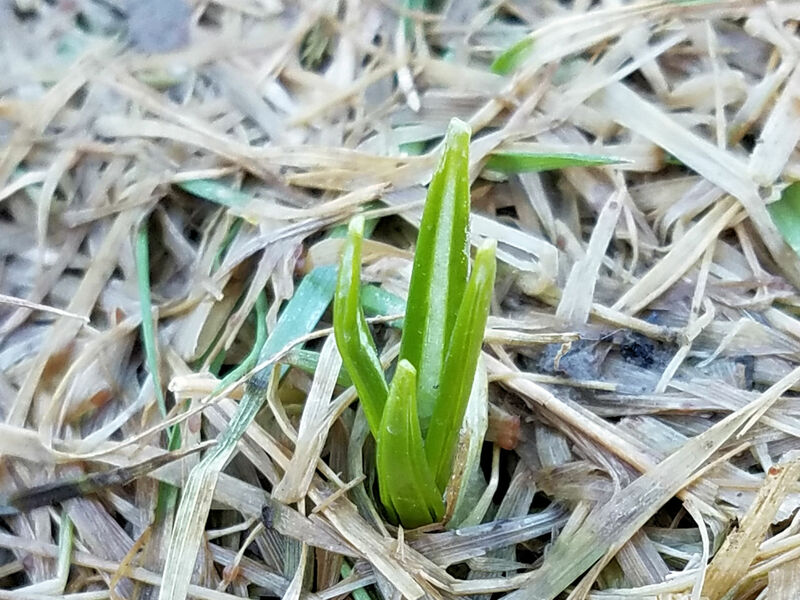 It’s not a traditional flower bed, but the snow melts there first, and the grass grows sparsely there so mowing can be delayed until the foliage of these early bloomers goes dormant. By the last day of the thaw, I had three winter aconites blooming there. I also had them blooming up against the house. Look how many are yet to come! And when I say “up against the house,” I do mean right up against it, under my cabin fever window. 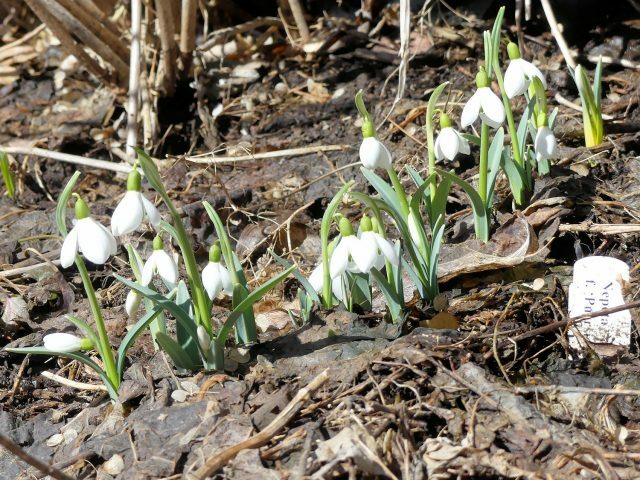 I also had the early-blooming snowdrop, Galanthus ‘S.Arnott’, blooming in several locations. These are at the base of an Incrediball hydrangea. Crocus korolkowii ‘Black-eyed Beauty’, my earliest blooming crocus, was also opening up. 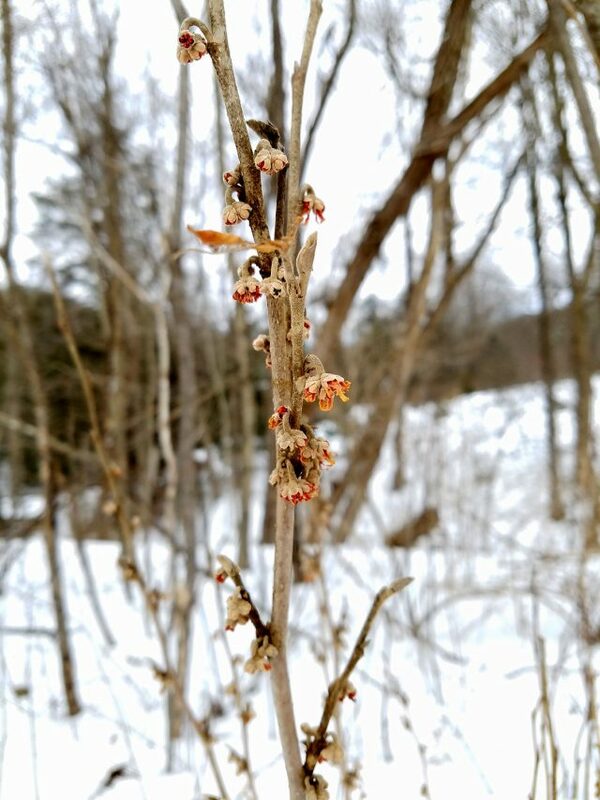 The vernal witch hazel continued to unfurl. Towards the end of the last warm day, a patch of snow melted, revealing several Cyclamen coum that must have started blooming under the snow. 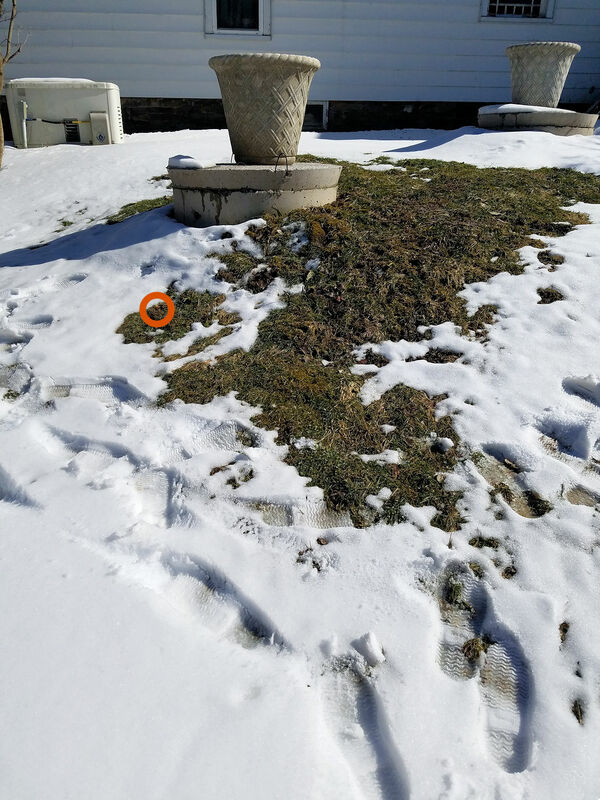 Several crocuses in the lawn were sending up leaves, promising flowers soon. And this ‘Double Fantasy’ hellebore is one of several in the Cabin Fever Bed showing big fat buds. But of course, the thaw didn’t last. The temperature dropped back into the 30s (~1.5C) and we’ve had more snow–though it has melted off the road. Another thaw is predicted for this upcoming weekend. Soon the thaws will run into each other and the snow will become a distant memory. But not yet. Meanwhile, inside the house . . . This amaryllis has sent up five stalks, two of which are done. There is a sixth stalk emerging! It’s the same one that I posed with here. The buds of the flowering quince that I brought inside to force are not quite the size of peas yet. I hope they will bloom indoors before the shrub blooms outdoors. I have never tried forcing flowering quince before. The forsythia I cut earlier this year bloomed within a week. The quince has been in the house for a good two weeks and looks like it will take another week (at least) to bloom. 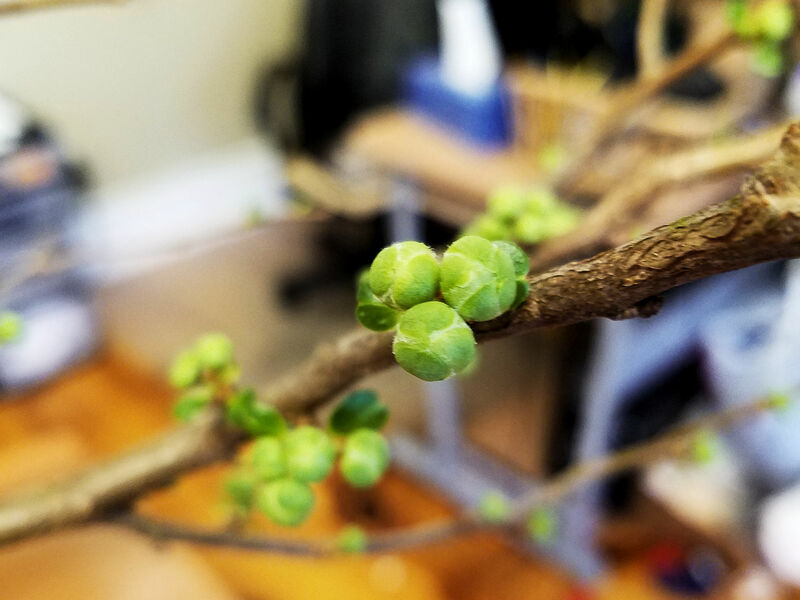 Experimenting with forcing branches indoors helps keep things interesting in between mud season treasure hunts for the earliest bloom. If you need more early-blooming plants in your yard, make sure you take pictures of where the snow melts first, and order some “desperate measures” this fall. 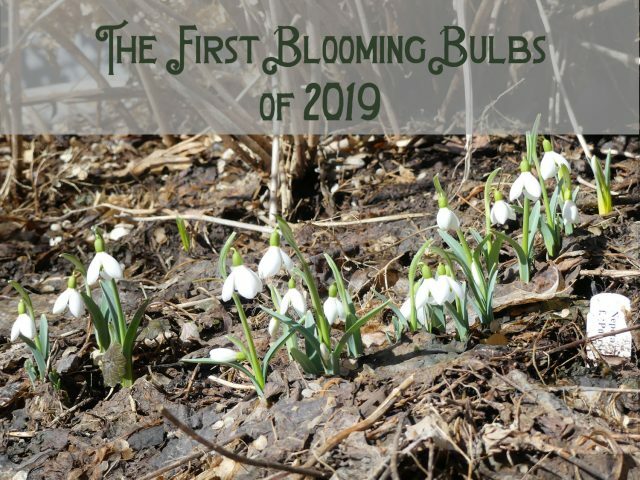 Kathy – You have given me ideas for where I can plant a few more bulbs that warm up early. I finally have a few tiny shoots that have been uncovered – and I want more! I’m glad I gave you some ideas. Also check out this post for more locations. Great blog post and lovely photographs! 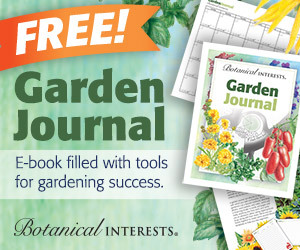 It’s so inspiring how you make the most of the outdoors and garden even in such a cold climate. my snowdrops against the house under the big window are about to open. But still so much snow that I can’t get around to see if I am as lucky as you are! I think Wisconsin got a lot more snow than my part of upstate NY. Usually we are at about the same spot in terms of what’s blooming. Wow! lovely snow drops…hope you have an early spring that brings more bountiful blooms …We are in mid spring enjoying every bit of spring…Have a great week ahead. Oh that does give me hope…no bare spots in our yard yet for bulbs to appear but the snow is melting fast as we’d finally have a whole week of above freezing highs and a 50 on the forecast for Friday. Thank you for sharing! Glad to hear your snow melt is making progress. Don’t forget to take pictures of where the snow melts first–and then plant bulbs there! Such a long, long wait Kathy! I loved the joy of Spring in the North Country and I thought I’d miss it more but … nah. In my new zone plum, peach, apple and redbud have been blooming for weeks already. My begonia continues to bloom, outside. I’ve already spied a hummingbird. 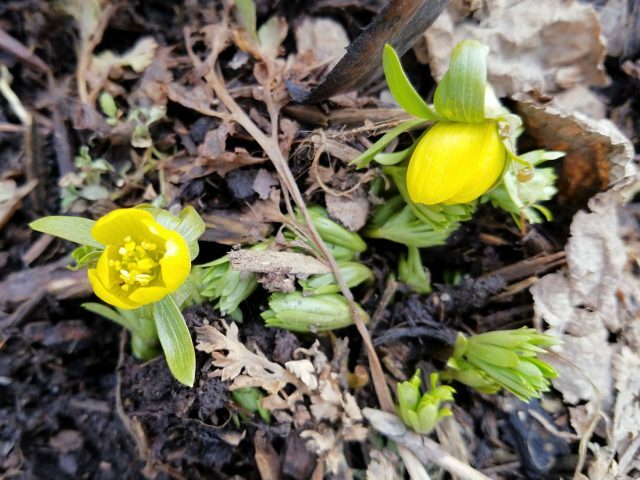 Winter aconite and crocus blooms were always some of my favorite! 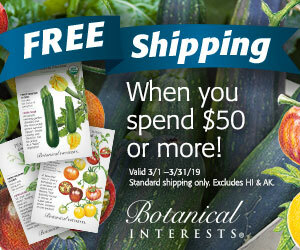 Looks like you will have a wonderful display! You are still with snow and cold while we here just started our dry season, but already very hot! 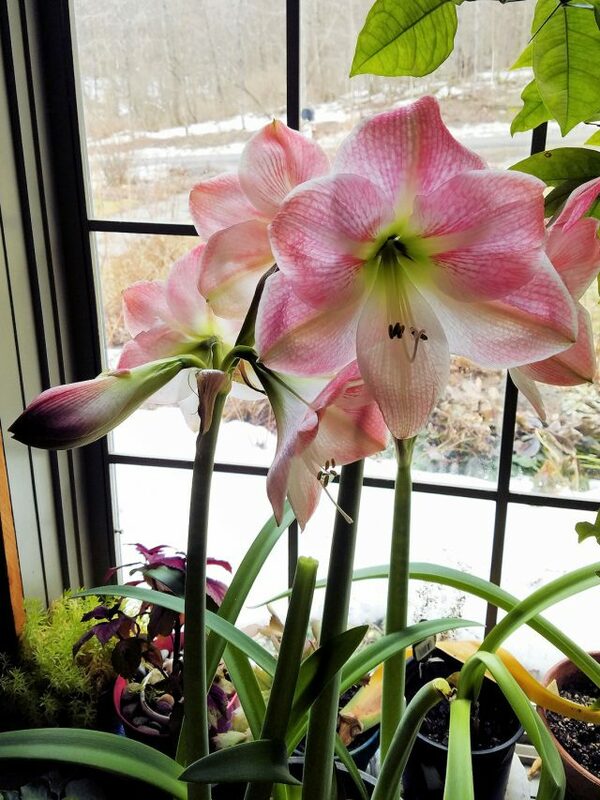 That hippeastrum is so beautiful, I also posted my forced bulbs. Our normal flowering is still in May after the first heavy rains. Thank you for taking the time to comment, Andrea. It sounds like you’re in a much warmer area than I am. We certainly have similar gardening conditions with our cold temperatures so I appreciated single glimpse of color in your garden! Yes, Nedra, similar cold, but I believe you have a drier climate.